This is the first of a two-part post showing some of the autographed books from my shelves. An early version of the Vincent Starrett autograph from 1918. Spend any time at all with Starrett material and it becomes clear that the man was often asked to autograph his own books. Some of the autographs are merely his signature. * More often there are nice inscriptions above his name, and in a few cases, there are little drawings that are as pleasing to the eye as the signature itself. One of the earliest examples of Starrett’s signature from my shelves is the little book Starrett had published in Chicago by Walter M. Hill in 1918, titled Arthur Machen: Novelist of Ecstasy and Sin. Starrett would have been 32 at the time and (if I've got his chronology right) still a reporter, although his interest in news reporting was waning by this point. Arthur Machen: Novelist of Ecstasy and Sin is a little volume (say 4.5 inches wide by 7 inches tall) and at 35 pages, it’s teen-ager thin. Charles Honce, who published a delightful bibliography of Starrett in 1941 (A Vincent Starrett Library: The Astonishing Result of Twenty-three Years of Literary Activity, Mount Vernon: The Golden Eagle Press) says this was Starrett’s first book. I’ve not found anything that would challenge Honce’s claim. I own No. 146 of the 250 in the limited (and only) edition of Arthur Machen: Novelist of Ecstasy and Sin. The signature in it is familiar, yet not exactly what we have come to know as the more common style. The incline slope, fantastic ‘S’ and the crossbar that appears above the first ‘t’ and last two ‘t’s in Starrett are variations on what would become a more common signature. "For Deborah Benson/With affection and good will/from her friend/Vincent Starrett"
Compare this 1918 signature with one from 30 years later in Starrett’s much beloved Books and Bipeds, published in New York by Argus Books Inc. in 1947. The book itself is a compilation of Starrett’s well-known “Books Alive” column from the Chicago Sunday Tribune. It’s a treasure chest, stuffed full of delightful tidbits and designed to get any book lover through a cold winter’s evening. The 1948 signature on my Books and Bipeds is much like those that you’ll find on the majority of Starrett’s books. His first and last names are compressed and the letters have lost much of their distinctiveness. 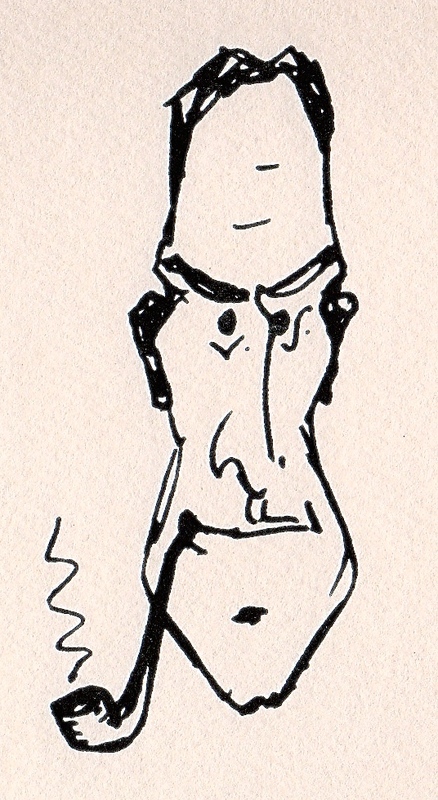 By this point, Starrett had written his name so many times that he had mastered the art of writing both his last and first name without lifting the pen, using the cross bar from the ‘t’ in Vincent to connect with the ‘S’ in his last name. It’s not hard to see that by this time in his career, Starrett was not only accustomed to autographing his books, but was doing so with a high level of economy of effort. I’ll finish this post with a few fun inscriptions. The inscription from a rare copy of Starrett's little biography of Ambrose Bierce. 1. Starrett inscribed the book with “Inscribed for the purchaser with all good wishes. / Vincent Starrett” prior to the book being purchased. I’ve seen other copies and they don’t carry this inscription, so he didn’t inscribe all 250 with this line. Perhaps he did this for Walter Hill (who was a friend), for some number of books. 2. A few years later, Bob Wetmore** (I’m only guessing at the last name. Starrett’s handwriting is often inscrutable.) purchased the book and asked Starrett to inscribe it. The 'Starrett Smiley', version 1. The fun part is the way Starrett turned his initials into a face. I’m sure there are other examples of this type of “Smiley Starrett,” but I have not seen anything exactly like this in any of his other books. Which is not to say he didn’t have fun with his signature. There are several variants of Starrett playing with his initials. An inscription from a copy of Autolycus in Limbo, 1943. Once again, there is a “Smiley Starrett.” The 1920 version had his initials as the hair and forelock of a cartoon face, but here the hook of the ‘S’ is now a nose. And while it’s probably my overactive Sherlockian imagination, I can’t help but think the top parts of the ‘V’ and ‘S’ form a sideways deerstalker. Here’s one more example, not from one of my books, but from a rare single-page piece published in 1974 by Michael Murphy for the Starrett Memorial Library. Only 35 copies were printed, and this is No. 34. 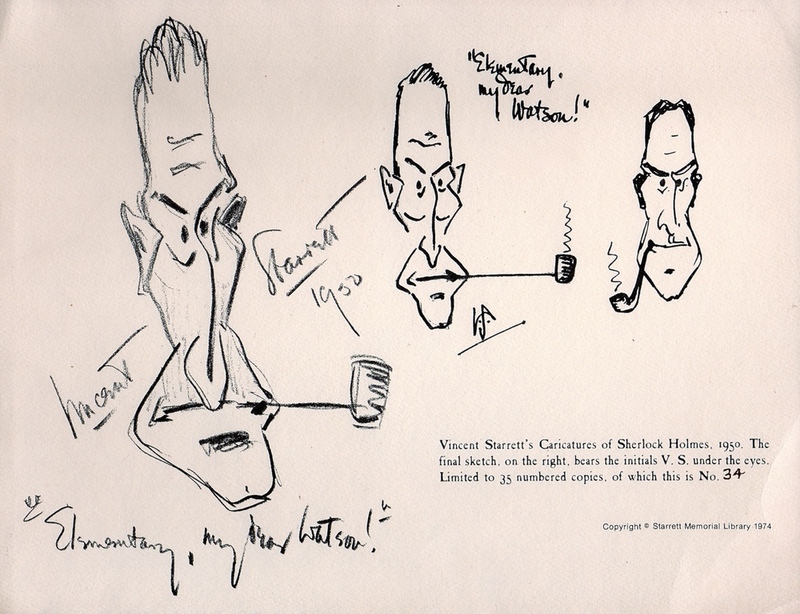 I don’t know where these sketches came from, but the interesting part to me is the appearance of Starrett’s initials under the eyes of the third Holmes sketch on the right. Shortly after Starrett's death, his friend Michael Murphy published several little items in limited editions. Here is a page, printed on card stock, showing several iterations of the 'Starrett Sherlock.' Starrett's initials are most obviously present in the image on the right. It shows a full evolution of Starrett’s initials over the course of almost 30 years. The “Starrett Smiley” has become a full blown Starrett Sherlock, complete with pipe. One wishes Starrett the writer had given himself over more often to Starrett the cartoonist. Are there other examples like this? At any rate, it's a lovely little illustration and shows Starrett's playful, Sherlockian side. If anyone knows where these images came from, I would love to know. Next time, we’ll look at Starrett’s style of inscriptions, including a few to notable Sherlockians. A Starrett inscription from the book Chicago Murders. More about this in a future post. NOTE: *One must always be cautious about books that only bear Starrett's signature. There is some question about the authenticity of some of Starrett’s “signed” volumes. But that is an issue for another day. SECOND NOTE: **Thanks to Susan Dahlinger for her help in decyphering this bit of Starrett penmanship.